Coach Troy Duke is entering his Third year at Marietta High School. Troy played under Rich Morgan, Scott Brunet, and Jason Allen from 2002-2006 at Oscar Smith High School in Chesapeake, Virginia. He graduated from Norfolk State University in Norfolk, Virginia with a degree in Interdisciplinary Studies. 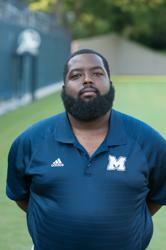 He spent the last 9 years at Oscar F. Smith High School serving as an Assistant Coach from 2007-2011, JV head Coach in 2011 and 2012 compiling an 18-0 record during that time. In 2013 he was promoted to Wide Receivers Coach. In his 3 seasons as Wide Receivers coach 8 of his receivers went on to play college football at various levels. Troy also coached Track at Oscar Smith and helped to lead them to several Top 5 and Top 10 finishes in the State. Troy currently is 8th Grade Behavioral Interventionist at Marietta Middle School.